The Miami Heat and rapper Pitbull have teamed up on a new version of his hit song "Feel This Moment" to get fans revved up for the team's 2013 playoff run. Mr. 305 personally rewrote and remixed the song, which features vocals from Christina Aguilera and debuted in a video during the Heat's dramatic overtime victory over the Indiana Pacers in Game 1 of the Eastern Conference Finals Wednesday night. "Miami Heat, we on fire, championship, we gonna ride," sings the Miami native, as he sports a white suit to support the White Hot Heat. "We don't talk about it, we be about it." 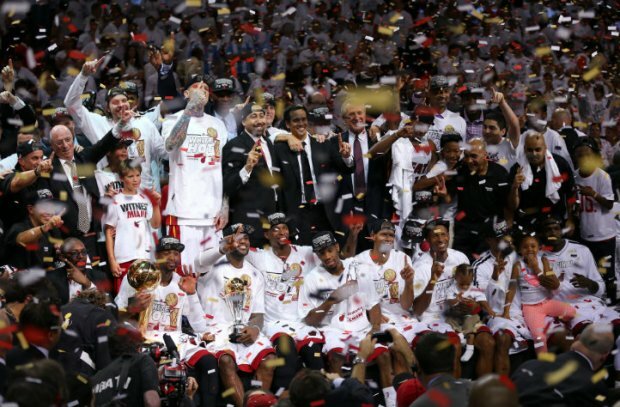 The video shows Heat fans throughout South Florida singing along with the words in their White Hot gear. “Pitbull is one of Miami’s native sons and we’re thrilled at the chance to collaborate with him on this creative project,” said Eric Woolworth, President of The HEAT Group’s Business Operations.